Before this article even starts, let me thank you for being a satellite TV enthusiast. You’re one of a small number of folks who want their TV their way and are willing to do the work to make it happen. There was a time when you had to have that DIY spirit in order to get satellite TV. Back in the 1990s, if you wanted satellite TV you bought all the parts — at full retail price at a local electronics store — and you installed every bit of it yourself. You aimed the dish, you hooked everything up, and the only thing that the satellite provider did was take your money. By 2000 or so, you could get free installation. Installations themselves got harder and people just wanted an easy experience that was something like what they got from the cable company. Still, a bunch of us still wanted to do it ourselves and that’s why Solid Signal was born. Today, I celebrate your spirit by letting you know about some parts you may have thought of using. A tap, or directional coupler, is a splitter where one output leg has a stronger signal than the other. This is done on purpose. The goal is to allow a strong signal down the line. The signal down the line (fancypants installers call it a trunk) is so strong that it would damage a receiver, but having a strong signal means you can run a long line. So, one output has relatively little loss, along the lines of 3dB. The other output has much more loss, as great as 20dB. In this case, you could run a signal through the trunk that was -5dBm. A signal that strong could travel 300 or more feet down a cable and still be usable. Connecting a tap means that the receivers along the way get the proper signal, not too strong and not too weak. When should a tap be used? Taps almost never belong in residential installations. Taps work for marine and commercial installs where you have extremely long runs. In the case of satellite TV, they’re exclusively used before the multiswitch if you’re using the latest Genie or Hopper systems. Using taps gives a lot of flexibility when cable lengths are long. That flexibility can mean very long cable runs or can give you the ability to run several multiswitches to accommodate dozens or even hundreds of receivers. 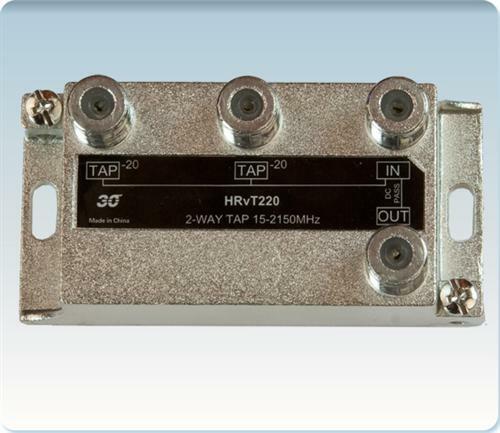 There are no taps out there that will support DIRECTV SWM or DISH Hopper systems. Those systems rely on two-way communication within a very short range. Really, the best answer to the question is, if you don’t know if you should use a tap, you shouldn’t. How can you plan out a large-scale or commercial installation? If you’re looking for help with a very large or complex installation, start by downloading our white paper, The Ultimate Guide to Upgrading. This comprehensive guide will help DIYers get the same results when installing a large DIRECTV system that the professionals get. If that isn’t enough, call our commercial arm, Signal Connect, at 866.726.4182. They’ll help you with parts lists, installation advice, and in many cases can help you completely plan your installation. Call any time during east coast business hours!